Flipkart Republic Day Sale is to be held on 20, 21 and 22 January 2016 this year. Prior to the celebrations of Republic day make your shopping experience more brighter. Flipkart Offers exclusive discounts and Cashback in republic day sale. Amazon had also conducted ➡ Amazon Great Indian Sale which would start from 21 January. If you want to buy Mobile, LED TV, Washing machines or any other appliances its the best time to shop. You will find some of the best electronics mela in this sale. Along with that if you want to purchase fashion related products like clothing, Backpacks, travel accessories, fashion accessories then you should just not wait and hop into the sale. 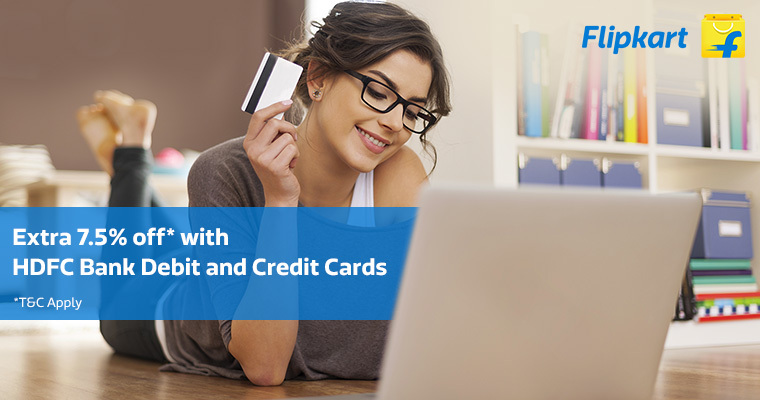 Get Extra discounts in this sale with HDFC bank Debit/Credit card. you will get Extra discounts of 7.5% on every purchase on Flipkart app. If you don’t want to purchase now then you can also use this offer to buy Flipkart Gift Voucher with discount and shop later. Like Previous Flipkart Sale like ➡ Flipkart Diwali Sale, ➡ Flipkart Refer and Earn, ➡ Flipkart Big Billion Days this gonna also be epic and you can find lots of discounts in the sale. You Don’t have to rely on gift cards deals or COD options because in this sale. You will see some exclusive offers for banks also. the participating banks which will get you extra 7.5% discount this sale. 20 January 2016 to 23 January 2016. The offer is valid from 20 January 2016 to 23 January 2016. 2. Make your Wish List ready before the sale. 4. Save your Debit/Credit Card details and enjoy a faster check-out.